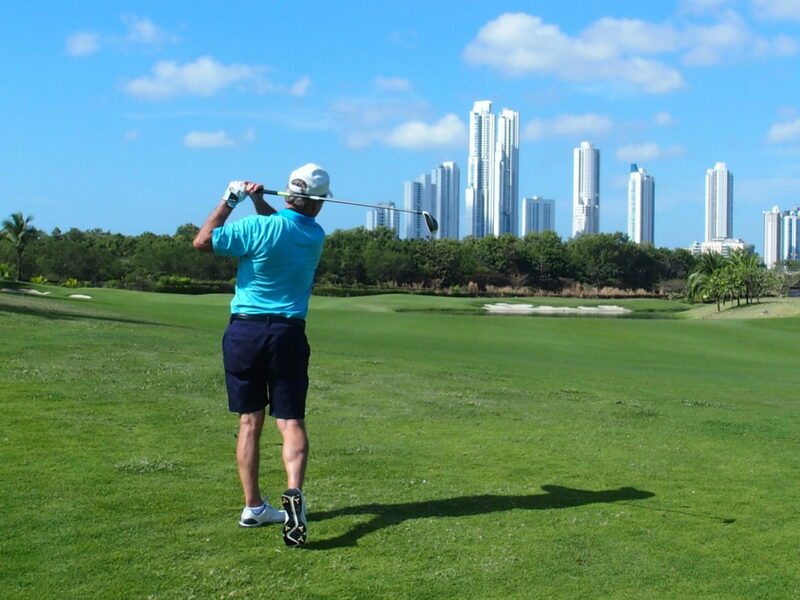 For golfers who arrive from destinations other than Dubai, playing at The Santa Maria Golf Course in downtown Panama City is unlike any 18-hole experience in the world. From the first tee box to your last putt on 18, expect to be “wowed” by vertical architecture stretching up to 75 stories in the sky. 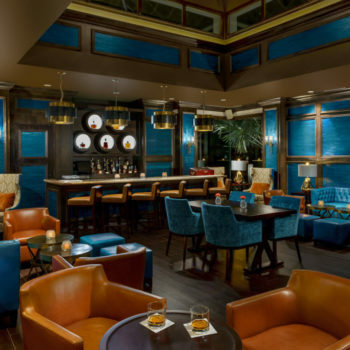 Stories are just part of the narrative when navigating this 7,000-yard Jack Nicklaus layout located 15 minutes from Panama City’s Tocumen International Airport. 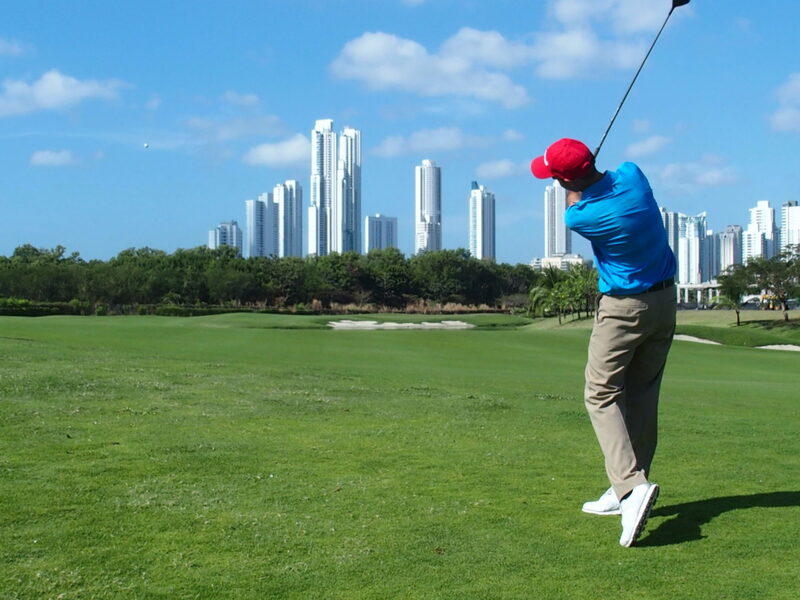 The visual theme emanating from this Panama golf journey is a breathtaking array of skyscrapers whose rooftops pierce the clouds and frame the golf course like a 3D painting. 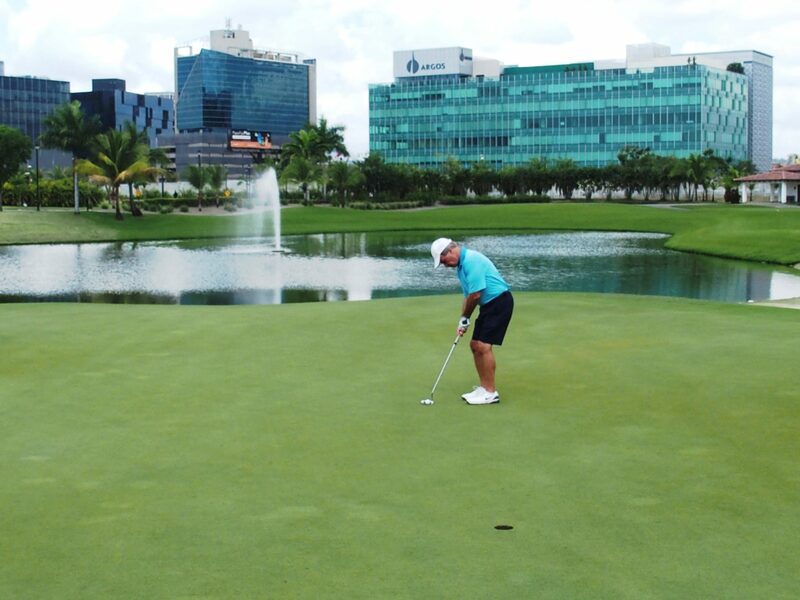 Nearly every hole on this perfectly groomed Paspalum fairwayed composition includes a backdrop of far-reaching buildings, luxury homes, and jungled mangrove. 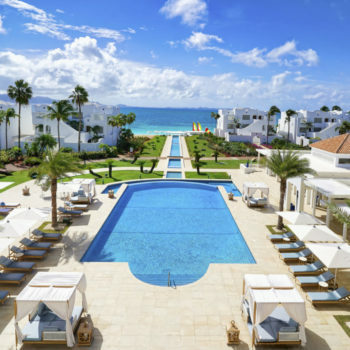 Throw in Panama’s robust birdlife, an occasional crocodile, and a historical thread tied to the world’s most famous canal, and you have a golf adventure that doubles as a photographer’s dream. 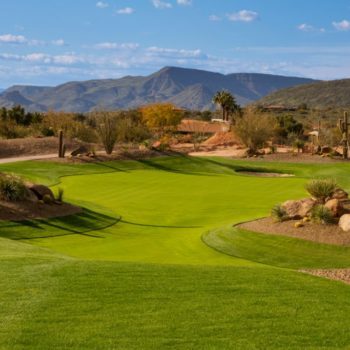 The one-of-a-kind Santa Maria momentum begins after holing out on the first green. That’s when you hop into your E-Z-Go golf cart and actually drive under the South Corridor freeway connecting the airport to Panama City’s bustling downtown. On the way to the Par 3, 195-yard second hole, you wrap your head around the idea of driving beneath a lifeline traveled by 1.5 million city residents. 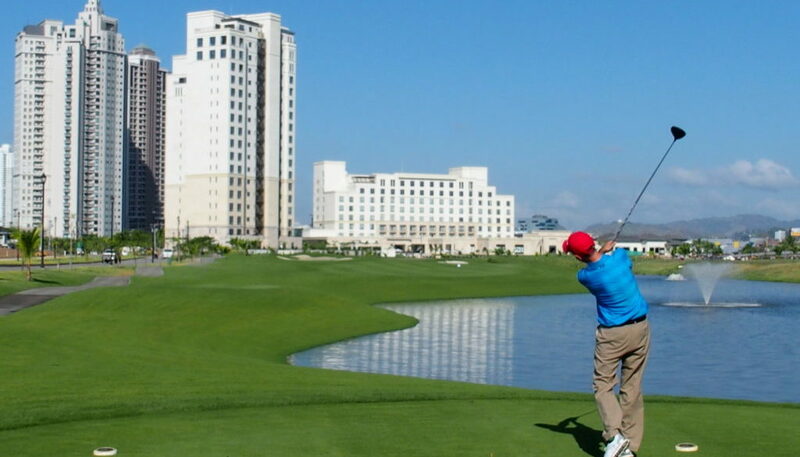 When you come out on the other side, you’ll catch a baptismal glimpse of a golf hole hugged by skyscrapers that feel so close you could bounce a three iron off their glass exteriors. The third hole brings more surprises as a chattering family of parrots spark a heated discussion in the tree behind the tee box. 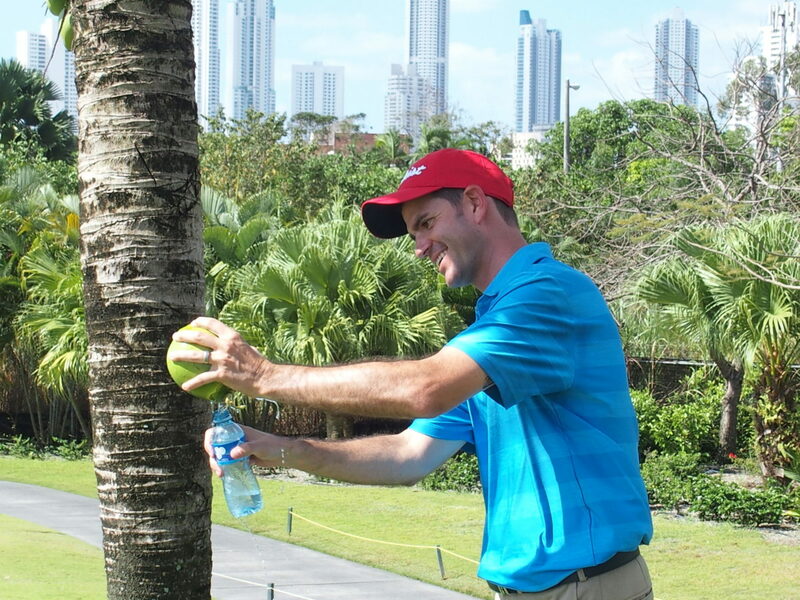 On the fourth hole you’re encouraged to pluck a coconut to chill in the golf cart’s cooler. This coconut juice awaits you as a refresher on the back nine. The fifth and 6th holes bring an environmental change of pace as the course goes quiet. Santa Maria Golf Professional Stephen Cashore calls these parallel neighbors two of his favorites. “I like the silence, the occasional crocodile sighting from the lake, and the camaraderie generated from 5 and 6,” the South Bend, Indiana native said. 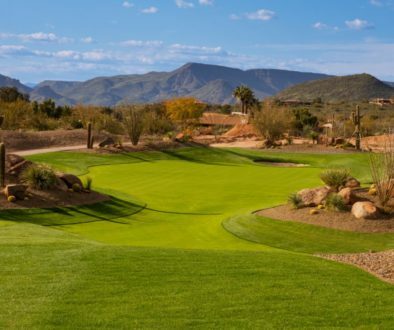 Upon finishing the Par 5, 510-yard 7th hole, it’s time to swerve back under the freeway and enter a golf environment bracketed by sky-bound structures you assume are commercial buildings. You learn that the estates on the right and behind the 8th hole green are actually residences owned by the Panama elite. 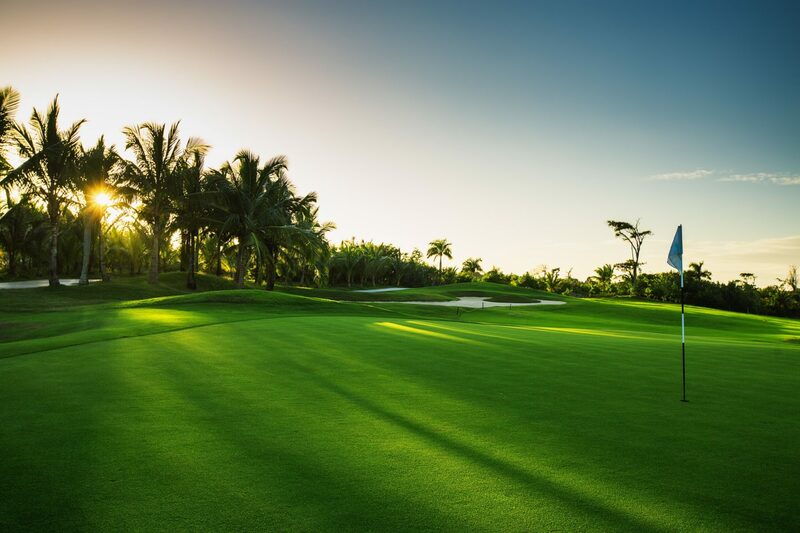 Home ownership at the Santa Maria residential community, called Costa del Este, is a natural for power brokers liking the convenience of conducting business and playing golf within a stone’s throw of the airport, downtown, and the Panama Canal. The Par 4, 367-yard 9th hole is a dramatic visual with glistening water on the right, and skyscrapers behind the sprawling green. 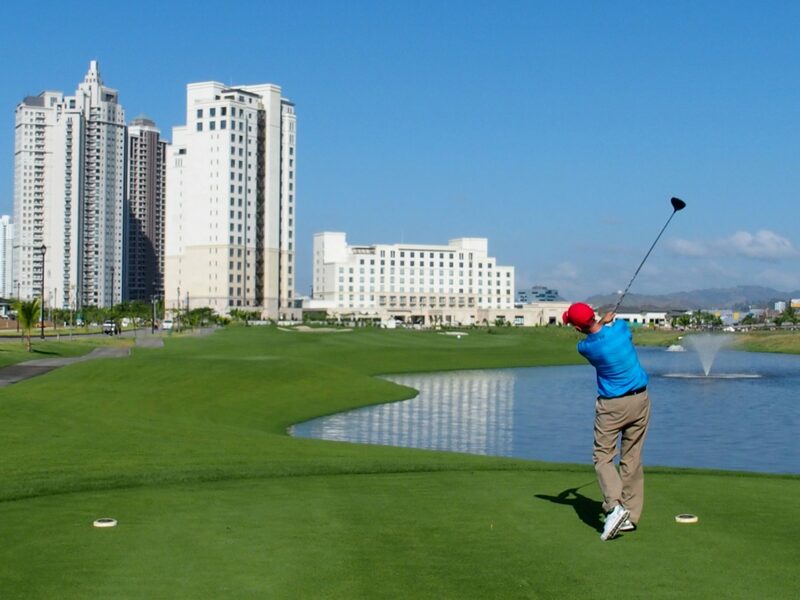 If target golf is part of your pre-shot routine, the goal is to swing in the direction of the two tallest towers that serve as a panoramic backdrop. Nicklaus wastes no time in keeping your attention on the back nine. Once you get to the green on the Par 4, 367-yard 10th, Cashore’s advice is to look back at the two shots you’ve just hit. You turn to see the Cordillera de Talamanca Mountain Range, and you guessed it, more skyscrapers. The Par 3, 186-yard 11th hole is the ideal time to reach for that coconut you’ve kept chilling in the golf cart’s cooler. Cashore has perfected a smashing technique for draining the coconut juice into an empty water bottle. This refreshing natural sports drink is good for your skin, your teeth, and your blood pressure. If you love photography as much as the links, the 13th hole is the home of the money shot. 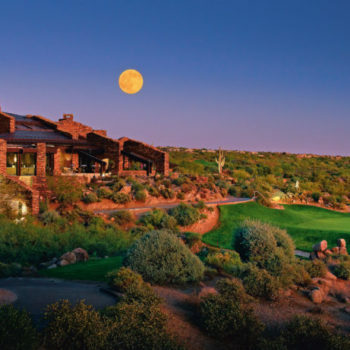 As you step up to your second shot from the fairway, prepare to be awed by the skyline view. Not only is Panama City the only place in the world where you can view the sunrise in the Pacific and sunset in the Atlantic, the city is also home to 20 skyscrapers that are at least 50 stories tall. The 13th hole visual reinforces all that Panama represents as an architecture and business juggernaut. As you hole out at the finish of this Golden Bear masterpiece, the closing symphony of dramatic water shots and lofty skyscrapers rise as one to say goodbye. 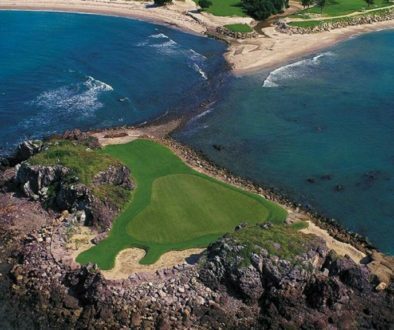 Short of playing 18 holes with an architectural historian in your foursome, it’s hard to imagine what Santa Maria could do for an encore. Cashore points out that this isn’t the end. 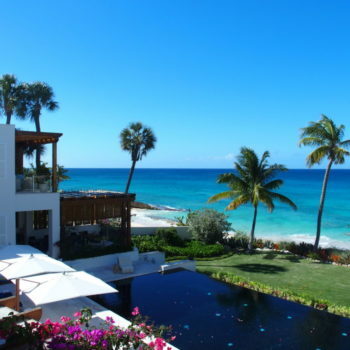 In fact, Santa Maria has a new beginning he’d love for you to experience. 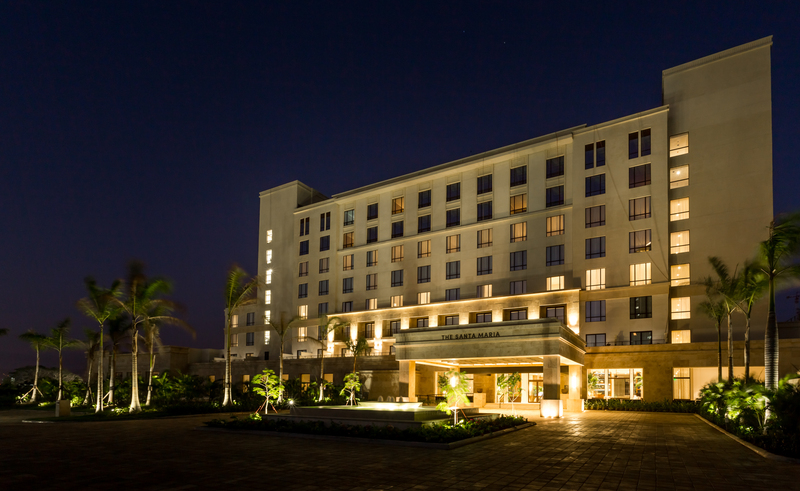 In February of 2018, the stunning 7-story, 180-room Santa Maria hotel opened for business. In May, the golf course also looks forward to unveiling its brand new clubhouse and restaurant. 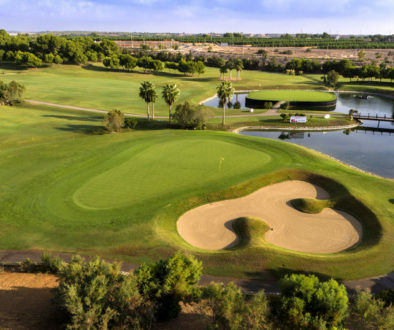 At the Santa Maria Golf Club and the new Santa Maria Hotel, the sky’s the limit for exceeding expectations.